The Star Wars saga triple bill was screened in nine cities in the U.S. and Canada. Star Wars: A New Hope, The Empire Strikes Back and Return of the Jedi were released together for the first time ever. 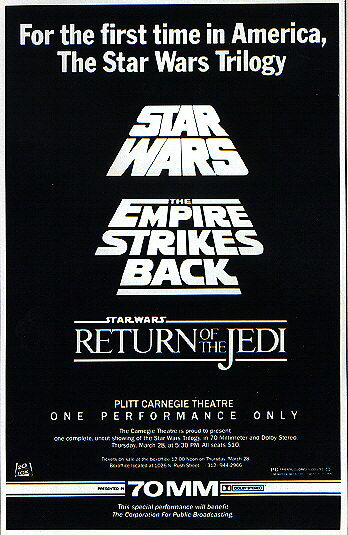 This ended up becoming an exclusive one-time only showing of the entire Star Wars trilogy in nine movie theaters across the USA and Canada in March 1985. Proceeds from the Canadian showing went to the Canadian Children's Foundation. The poster (at the top) is extremely rare. Each theatre received just two posters, which featured the three films' logos, the name of the theater, address and ticket sales information.